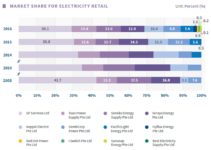 It’s little wonder that consumers in the UK are flocking to switch their energy suppliers following announcements of price hikes of up to 11% from five of the ‘Big 6’ energy companies. What’s interesting is where they’re choosing to go. The newer entrants are reporting some big customer gains, as householders reject the incumbents’ inflation-busting rises in favour of cheaper deals. According to a survey by the BBC, over 150,000 households have already switched to alternative energy retailers since early October and the party’s not over yet. First Utility (the biggest independent) tops the list of gains, receiving a whopping 100,000 energy applications. Put into context, that’s an increase of more than 50% on its previous 190,000-strong customer base. The company, whose mantra has long been to provide a cheaper alternative to the Big 6 (British Gas, EDF Energy, E.ON, npower, Scottish Power and SSE), has pledged to hold its energy prices until March 2014. That shrewd move gives customers the confidence to switch knowing that they are not about to be hit by another rate increase from their new supplier. 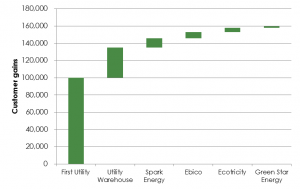 Utility Warehouse has also fared well, winning around 35,000 new customers. It guarantees that consumers will always save on its gas and electricity tariffs, compared to the average of the cheapest variable tariffs of the Big 6. There are further discounts and benefits for customers who combine energy from Utility Warehouse with home phone, broadband and mobile services. Spark Energy has seen a net gain of 10,000 customers in the past few weeks – losing only 1000 customers compared to 11,000 won. Originally targeting the rental/landlord segment, the company now also serves private homes. At mid-November its ‘Spark Advance 2’ tariff was the cheapest on the market, according to consumer champion Which?. Customers on the tariff benefit from a discount on Spark’s standard rate, in return for paying a month in advance for their usage. However, not all the smaller players have been winners. The BBC noted that LoCo2 Energy has failed to make “significant gains” despite experiencing more than usual interest. This is hardly surprising, given the firm had already raised its prices by 9.5% – a factor that the BBC seems to have missed. LoCo2’s proposition is just as much about going green as it is about price, and it offers a range of tariffs promoting renewable energy and carbon emission reductions at price points suited to different household budgets. The new entrant retailers are not the only ones to have benefited from the UK’s latest switching fest. EDF Energy claims over 350,000 new gas and electricity customers since the start of October – more than twice the reported gains of the new entrants combined. 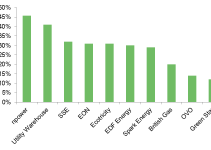 EDF has deferred raising its prices until January 2014 and curbed its increases for both electricity and gas to just under 4%, compared to uplifts of 8-11% from British Gas, Npower, Scottish Power and SSE. EDF is offering some competitive fixed price deals, including a tariff that is frozen until March 2015 with no exit fees. But despite this upsurge in switching activity, the UK’s retail market is not as competitive as it should be. Only a relatively few customers bother to switch – over 60% claim never to have done so – and the ones that do tend to regularly shop around the newer suppliers looking for the best deals. The result is that the new entrants are experiencing higher churn rates than the Big 6, whose customers are more ‘sticky’. And that’s perhaps what we’re missing here – the wider context of how much churn the new entrants are having to shoulder. They may be making gains now, but how long can they retain these customers?